STEVENS POINT, Wis. (April 14, 2015) -- In honor of National Travel & Tourism Week, scheduled for May 2-10, 2015, the Stevens Point Area Convention & Visitors Bureau (SPACVB) will be hosting a Tourism Takeover at the Stevens Point Brewery on Saturday, May 2. The Stevens Point Brewery is one of the oldest continuously operating breweries in the United States, operating since 1857. Last year, they had over 11,000 tour visitors. The Stevens Point Brewery has invested more than $6 million in six years in major expansions to improve production efficiencies and purchase new equipment and a gift shop face-lift. Production of beer and cider has seen extensive growth – in 2008, the Stevens Point Brewery produced 60,000 barrels per year. Production grew to 150,000 barrels per year in 2014. While the Stevens Point Brewery is the oldest brewery in the region, it doesn’t stand alone as a tourism icon. It is part of the Central Wisconsin Craft Collective, which links together craft brewers, winemakers and distillers in Portage County including; Central Waters Brewing Company in Amherst; Plover’s O’so Brewing Company and Great Northern Distilling; Kozy Yak Brewery & Fresar Winery in Rosholt. The Stevens Point Area Convention & Visitors Bureau doesn’t stop there when promoting the region. As the official destination marketing organization for the communities within Portage County, the SPACVB works collaboratively with a diverse mix of organizations, to bring people to the area and to create a positive impact in the communities we serve. The SPACVB focuses on key strengths that drive tourism throughout Portage County in four key markets, including Leisure Travel, Sports, Meeting & Conventions and Groups. 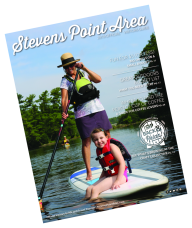 For more information about the Stevens Point Area, visit StevensPointArea.com. The SPACVB can also be found on Facebook (facebook.com/StevensPointArea), Twitter (twitter.com/StevensPtArea), Pinterest (pinterest.com/StevensPtArea) and Instagram (instagram.com/stevenspointarea).